The title of this entry is a little unwieldy, no? However I thought it important to convey as much information about the figure as possible in the heading, as there’s a lot to unpack. 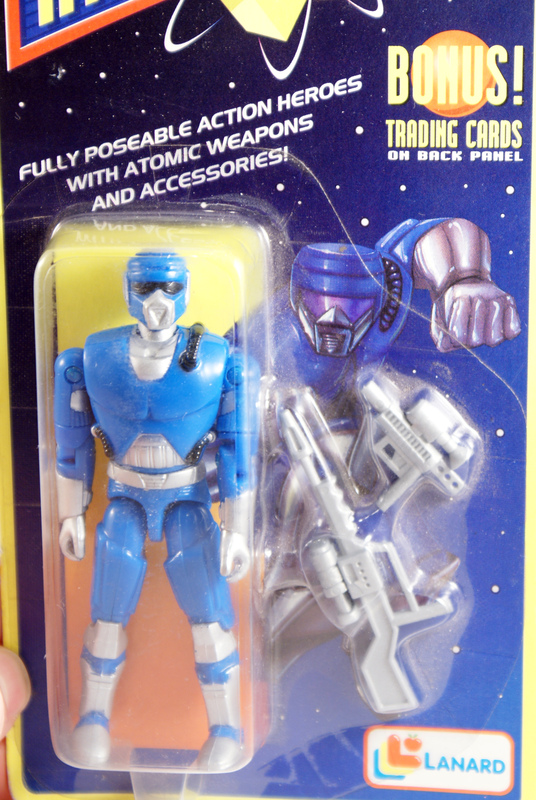 Lanard, makers of the perennial GI Joe me-too line The CORPS! are no stranger to knocking off whatever may come along in the toy aisle or cultural zeitgeist. A natural progression for them as the 1990s wore on would have been from the military focus of GI Joe to the up-and-comer Power Rangers. And hey–the company already had some molds on hand that could fill in, thanks to another figure series. Paint ’em up in the usual primary sentai colors, and bang–instant sales! 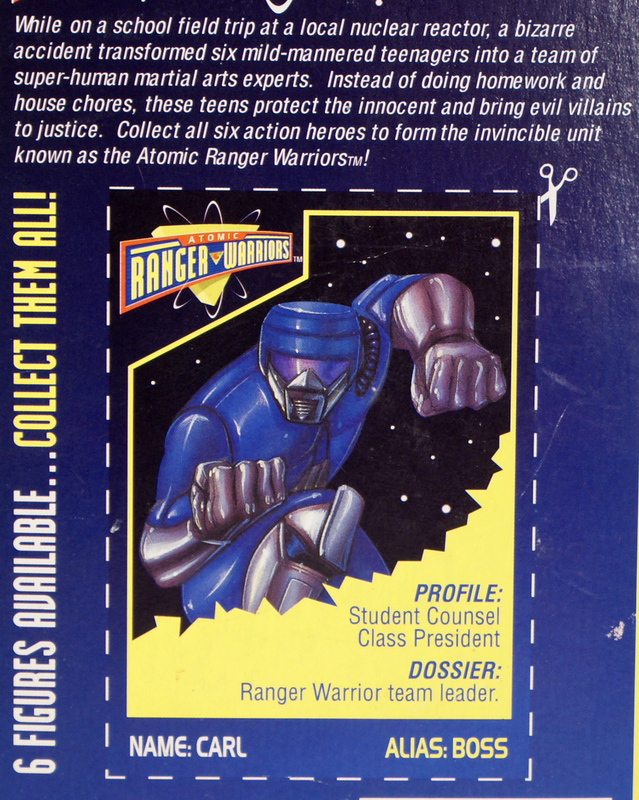 This is the blue Atomic Ranger Warrior, the leader of the team, as pointed out on the included file card. Guess Lanard felt it necessary to retain some elements of 80s packaging copy–though there’s no cross-sell information to be found. We’ve also got a code name or alias to boot, the wholly generic Boss. What, were Manager, Chief or Honcho taken? The character’s real name is Carl, which to me skews older than you’d probably want in a Power Rangers knockoff. I would have gone with Justin or even Tommy. Right off the bat, things are a bit lame in the mythos department. The mold itself was also released as Incinerator, from the double-whammy of awesome that was the vac-metalized and light-up series Lazer Force. If you want to shoehorn it into your Joeverse, the figure could be used for something like a security droid, or maybe an experimental Cobra BAT. But wait–there’s more to share! The Atomic Ranger Warriors also made an appearance in a larger scale, with ball-joint rather than o-ring construction, I presume to more accurately copy Bandai’s original 9 inch scale Power Ranger figures. “Student Counsel Class President”. Hey, someone’s gotta counsel those students. Love the Lanard Oring stuff. The endless ways they found to recycle molds is amazing. This guy seems to have some pretty unique parts than your typical CORPS figure.